Asia is the world's largest continent, encompassing an area of 17,139,000 square miles (44,390,000 square kilometers), almost 30 percent of the world's land area. Because Asia covers such an enormous area and contains so many countries and islands, its exact borders remain unclear. In the broadest sense, it includes central and eastern Russia, the countries of the Arabian Peninsula, the far eastern countries, the Indian subcontinent, and numerous island chains. It is convenient to divide this huge area into five regions: the Middle East, South Asia, Central Asia, the Far East, and Southeast Asia. zones, from the tropical jungles of the south to the arctic wastelands of the north. The Middle East region contains the countries of Bahrain, Iran, Iraq, Israel, Jordan, Kuwait, Lebanon, Oman, Qatar, Saudi Arabia, Syria, Turkey, United Arab Emirates, and Yemen. Most of these countries lie on the Arabian Peninsula, an area that stretches from Turkey in the northwest to Yemen in the south. The peninsula is bordered on the east by the Persian Gulf and on the west by the Red Sea. In general, precipitation is low and the climate is extremely dry. Much of the area is still a desert wilderness. Vegetation is mostly desert scrub. One area that is well-watered and fertile is the historic Fertile Crescent, which includes parts of Iraq, Israel, Jordan, Lebanon, and Syria. The fertile river plains and valleys of this area are watered by the Euphrates and Tigris Rivers. The Dead Sea, located in Israel, is the lowest point on Earth's land-masses, lying 1,290 feet (393 meters) below sea level. It takes its name from the fact that it is one of the saltiest bodies of water in the world and, therefore, supports no aquatic life. It yields large amounts of potassium chloride, magnesium bromide, and many other mineral salts. Lake Tuz, in Turkey, also has a high level of salinity and is used as a source of salt. Coniferous: Refers to trees, such as pines and firs, that bear cones and have needle-like leaves that are not shed all at once. Deciduous: Refers to trees, such as oaks and maples, that shed all their leaves at the end of the growing season. Delta: Triangular-shaped area where a river flows into an ocean or lake, depositing sand, mud, and other sediment it has carried along its flow. Plateau: An elevated area which is flat on top; also called tableland. Steppe: Wide expanses of relatively level plains, found in cool climates. Large oil reserves are found in most Middle Eastern countries, especially Saudi Arabia. The world's largest oil field is in southern Saudi Arabia in the Rubʿal-Khali Desert. This virtually uninhabited desert covers an area of about 250,000 square miles (647,500 square kilometers). It features sand dunes that rise to over 66 feet (200 meters). Steep mountain ranges divide up both Lebanon and Turkey. The ranges in Lebanon have been carved by erosion into intricate clefts and valleys, lending the landscape an unusual rugged beauty. Turkey's highest peak, Mount Ararat (legendary resting place of Noah's ark), reaches 16,945 feet (5,165 meters). Turkey is also a country of seismic activity, and earthquakes are frequent. The South Asia region contains the countries of Afghanistan, Bangladesh, Bhutan, India, the Maldives, Nepal, Pakistan, and Sri Lanka. Great mountain barriers isolate this region from the rest of Asia. South Asia can be further divided into three subregions: the Himalayan Mountains, the Ganges Plain, and the Indian peninsula. The Himalayas stretch about 1,500 miles (2,410 kilometers) across Asia, from Pakistan through India, Nepal, Tibet, and Bhutan. They range from 150 to 210 miles (250 to 350 kilometers) wide. The Himalayas are the highest mountains in the world, and are still being pushed upwards at a rate of about 2.5 inches (6.3 centimeters) a year. This great mountain range originated about 25 to 70 million years ago when the Indian subcontinent collided with Asia, forcing Earth's crust to fold. 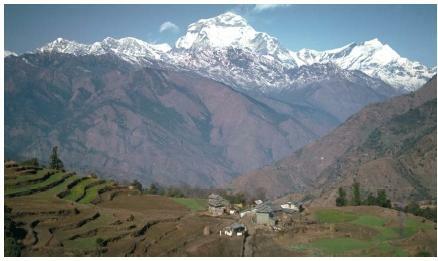 The Himalayas are the youngest mountains in the world, which accounts in part for their great height. Some 30 peaks in the Himalayas rise to more than 25,000 feet (7,620 meters), including Mount Everest between Nepal and Tibet. Not surprisingly, many of the mountains in this range are covered with glaciers. South of the Himalayan mountains, lying in northern India, is the Ganges Plain, which holds the Ganges and Brahmaputra Rivers. The plain is one of the most well-watered and fertile regions of Asia, fed by many tributaries and by the snow and ice from nearby mountains. Because the majority of the plain is flat and close to sea level, however, it is plagued by frequent flooding. South of the plain is the Indian peninsula, a region of low plateaus and river valleys. It is bounded on the west by the Ghat mountain range and on the north by the Thar Desert, a desolate region about 500 miles (800 kilometers) long and 250 miles (400 kilometers) wide. In its southern extent, the Thar borders on salt marshes and the great lava expanse called the Deccan plateau. Central Asia includes the countries of Armenia, Azerbaijan, Georgia, Kazakhstan, Kyrgyzstan, Mongolia, Russia (central and eastern areas), Tajikistan, Turkmenistan, and Uzbekistan. Many of the areas in this region are cold and inhospitable. Plateaus, desert and forest steppes (wide expanses of relatively level plains), and irrigated farmland mark a majority of the areas in this region. Mountains rise mainly along the east coast of Russia. Temperatures are often extreme in this region. In Mongolia, temperatures fluctuate wildly, from −40 to 104°F (−40 to 40°C). The top one-third of Russian Siberia lies within the Arctic Circle. The climate is very harsh. Temperatures fall as low as −94°F (−70°C), and there are only 100 days a year when it climbs above 50°F (10°C). Lake Baikal, in southern Siberia, is the largest freshwater lake in both Asia and Europe. It covers an area of 12,160 square miles (31,494 square kilometers). The world's deepest lake, it has a maximum depth of 5,714 feet (1,742 meters). Baikal is rich in aquatic life. It is the only habitat of 600 kinds of plants and 1,200 kinds of animals, making it home to two-thirds of the freshwater species on Earth. The Far East region contains the countries of China, Japan, North Korea, South Korea, and Taiwan. Most of these countries are rugged and mountainous. Many forested areas exist in the region, though, since rainfall is more plentiful than in the Middle East. Volcanic activity and the movement of Earth's crust formed many island chains in this region. Japan is a country of frequent earthquakes and intense volcanic activity, with more than 60 active volcanoes. Over 70 percent of its terrain is mountainous. The highest mountain peak is an extinct volcano called Mount Fuji, which reaches an altitude of 12,388 feet (3,776 meters). The Korean peninsula, on which North and South Korea lie, is also very mountainous. Lowlands and plains compose only about 20 to 30 percent of the peninsula's land area. Mount Paektu, an extinct volcano with a lake in its crater, is the highest point on the peninsula at 9,003 feet (2,744 meters). In contrast, China contains many regions of fertile land and temperate climate. In northern China, most of the land is made up of fertile plains. Running through this area is the Yellow River (Huang He), which has been called China's Sorrow because of its great flooding. 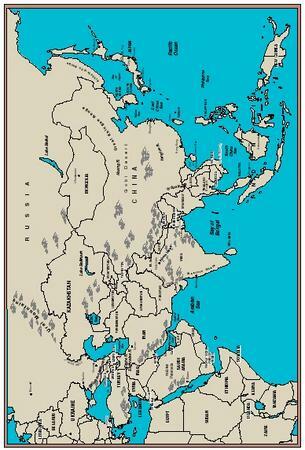 Central China also contains many rivers, including the great Yangtze. Several freshwater lakes are spread across this area. The largest of these, and the largest in China, is called the Poyang. The climate in southern China is tropical and the land is very fertile. The Pearl River delta, which lies in this region, has some of the richest agricultural land in China. In western China, fertile lands give way to cold and arid regions of mountains and highlands. The Gobi Desert, the fifth largest desert in the world, is located in northwestern China. The Gobi, which means "waterless place," encompasses an area of 500,000 square miles (1,295,000 square kilometers) and averages two to four inches of rainfall a year. Southeast Asia includes the countries of Brunei, Cambodia, Indonesia, Laos, Malaysia, Myanmar, the Philippines, Singapore, Thailand, and Vietnam. The region is quite tropical and tends to be very humid and rainy. Mountainous areas are extremely rugged. Both mountains and highlands throughout the region are covered by jungles and forests, including tropical rain forests, deciduous forests, and coniferous forests. Because these remote areas are often inaccessible to humans, they have become home for many unusual animal and plant species. Great rivers often drain the mountainous areas in the region, flowing into plains. In Thailand, the Chao Phraya River flows through a central lowland plain, making the surrounding land rich and fertile. The Mekong River, which begins in the highlands of Tibet, flows through Laos along most of its western boundary with Thailand before entering Cambodia. In the center of Cambodia is the Tonle Sap (Great Lake), and many of the rivers that water Cambodia flow into this lake. During the winter, when the Mekong River floods, it forces the flow back from the Tonle Sap into its tributaries, flooding the surrounding area with rich silt. The Mekong finally reaches the South China Sea in south Vietnam where it forms a wide delta. Extremely fertile, this delta is one of the greatest rice-growing areas in Asia. The island chains of Malaysia, Indonesia, and the Philippines are extremely fertile and have large regions of tropical rain forests containing an enormous variety of native wildlife. Indonesia and the Philippines are also sites of much volcanic activity. Indonesia has an estimated 100 active volcanoes. This information was very useful on my research. Thanks for featuring such. could you answer my question pls. :) what is/are the basis why they divided the Asia into 5 regions? ?